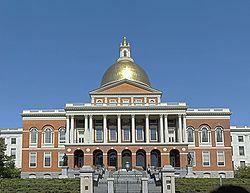 Several Democratic primaries are taking place Tuesday in western Massachusetts House and Senate districts. One of the more spirited contests is between four-term incumbent State Senator James Welch of West Springfield and former Springfield City Councilor Amaad Rivera. The challenger accuses the suburban legislator of siding with special interests. "We need a new voice and new change and with your vote on September 4th, we can move in a new directions," said Rivera during a recent debate at FOCUS Springfield. Welch said his opponent has distorted the facts.
" I've run a very clean, a very positive and most importantly a very honest campaign," declared Welch during the debate shown on Springfield's cable access channel. Across Hampshire and Franklin counties more than a dozen Democrats are campaigning in legislative districts left open by death, resignation, and retirements.